Our NC Mountain Log Cabins near Grandfather Mountain and Linville Falls NC offer Rental Lodging that is in close proximity to many of the most popular attractions in Western North Carolina. Our Mountain Cabins Rentals are great for people who wish to explore the many natural wonders the area has to offer. Many who visit our Western North Carolina Cabin Rentals seek to enjoy the scenic beauty of the Blue Ridge Mountains through activities like Fly Fishing in NC, Hiking North Carolina, Whitewater Rafting in NC, or even playing a round of golf at one of the two great public North Carolina Golf Courses that are within eight miles of our Cabins in Pisgah National Forest. Another of the more popular Western North Carolina Attractions, Grandfather Mountain North Carolina, is just eight miles form our Cabins Hot Tub Western North Carolina. Home to a mile-high swinging bridge, wildlife habitats, and numerous opportunities for North Carolina Hiking, Grandfather Mountain NC is a wonderful place for those staying in our Western NC Mountain Cabins Rentals to go to learn more about the area around our Linville Falls Lodging. Guests who stay at our Blue Ridge Parkway Cabins enjoy visiting Grandfather Mountain North Carolina for a variety of reasons. One of the most unique features of this popular attraction is the Mile High Swinging Bridge that rests atop the 5,946-foot-tall mountain. The Mile High Swinging Bridge is a 228-foot suspension bridge that spans an 80-foot gulch high atop Grandfather Mountain North Carolina. Boasting unparalleled views of the surrounding Blue Ridge Mountains, the Mile High Swinging Bridge can be reached via 50 stairs. Don’t be fooled by the name—the bridge does not actually swing; it is referred to as a “swinging bridge” because suspension bridges are built with the ability to sway with high winds, which saves them from breaking when large amounts of pressure are placed upon them. The bridge was originally dedicated in 1952, but was restored and redesigned in 1999 for a cost of $300,000. There is perhaps no more unforgettable way to experience the beauty of the area in which our Cabins on the Blue Ridge Parkway are located than by admiring it from the Mile High Swinging Bridge atop Grandfather Mountain NC. The wildlife habitats at Grandfather Mountain are another large draw, and guests at our Rental Cabins Western North Carolina often visit the attraction to get close-up views of the wildlife that inhabits the area in which our Vacation Rentals in Western NC are located. The seven environmental habitats at Grandfather Mountain North Carolina contain black bears, river otters, cougars, bald eagles, golden eagles, and white-tailed dear, all of which are native animals. These environmental habitats at Grandfather Mountain North Carolina are different from the habitats found in city zoos because they were actually built around the animals’ natural habitats. Guests can stand just feet away as they observe the animals in their native environments, and the aquarium-like viewing area that allows guests to watch the otters as they frolic underwater is always an exciting experience. Grandfather Mountain North Carolina is also a fabulous place to visit if you want to enjoy the scenic beauty of the Blue Ridge Mountains on foot. Though our Cabins Hot Tubs for Rent Western North Carolina are surrounded by many fabulous hiking areas, you won’t want to miss Grandfather Mountain’s three nature walks and eleven hiking trails. The Woods Walk, the Black Rock Nature Trail, and the Bridge Trail all offer visitors the opportunity to take leisurely strolls through the natural environment surrounding Grandfather Mountain. The Woods Walk contains at least 64 different types of flowers and 19 different species of trees; the Black Rock Nature Trail provides a panoramic view of the Mile High Swinging Bridge and many of the surrounding peaks; and the Bridge Trail is the perfect place to view rhododendron, red spruce, galax, Frasier fir, and yellow birch. In addition to these wonderful attractions, Grandfather Mountain North Carolina is home to a visitor center, a Nature Museum, fabulous picnic areas, and naturalist programs, in addition to incredible scenery. Restrooms, a restaurant, and even an ATM are all located on the premises. Only eight miles from our Linville Gorge Lodging, Grandfather Mountain is an attraction that you won’t want to miss. Our Rental Cabins Western NC are ideally situated so that our guests will have easy access to all of the best Things to Do in Western North Carolina. Visit Grandfather Mountain North Carolina on one day of your stay at our Western NC Cabin Rentals, try Biltmore Estate Asheville the next, and embark upon a Whitewater Rafting in NC adventure the next day. You’ll be amazed at the number of activities it is possible to participate in when you stay at our Western NC Cabins. From Fly Fishing in NC just yards away from our Linville Falls Lodging to endless numbers of Hiking in North Carolina trails to unforgettable natural wonders like Linville Caverns NC, Linville Gorge North Carolina, and Linville Falls, our Rental Cabins Western NC are close to all of the activities you’ve been dreaming of. Reserve one of our Vacation Rentals in Western NC today and get ready for the vacation of a lifetime! 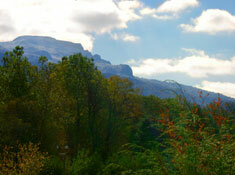 Come stay with us and enjoy a cozy rental cabin near Grandfather Mountain NC.